Van Bergen & Markson, Inc. provides complete pump repair and service, as well as comprehensive customer and product support. Our staff includes experts on every type of fluid pump. Van Bergen & Markson has an on-site, authorized service and warranty repair center for many leading manufacturers. We service and repair all brands of pumps with quick turnaround. Contact us for all of your maintenance and repair needs. Periodic maintenance is required to keep all forms of rotating equipment running as efficiently as possible. Send your equipment to us for repair and maintenance, or to save time, our equipment experts can come to you. Contact us for more information. Repair and assembly of products used in high purity applications. Other services include system surveys and recommendations, failure analysis and corrective action plans, as well as emergency service. 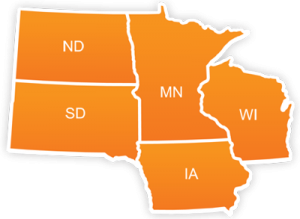 Van Bergen & Markson, Inc. services industrial facilities throughout Minnesota, Wisconsin, North Dakota, South Dakota and Michigan’s upper peninsula.